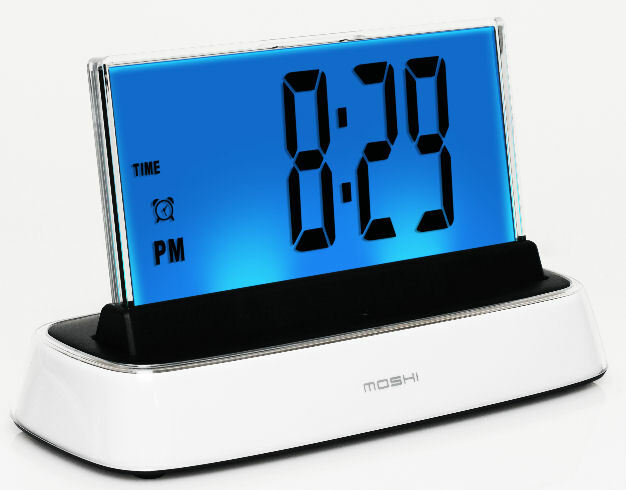 Moshi is just about the coolest alarm clock on the market! Originally invented for the blind, this interactive clock is fun, practical and has a sleek and stylish design. You say “Hello Moshi” and a pleasant female voice immediately answers “Welcome, Command Please.” Moshi responds to anyone who greets her with 12 voice-activated commands and beautiful, changing prism colors as commands are exchanged. She gives you the time, date, and the weather either on the display or with the interactive voice technology. Just by asking Moshi, she will play a light show for you, let you pick one of three soothing sleep sounds to help you fall into a deep and restful sleep or give you a choice of three alarm sounds to wake you up. There is also a 9-minute touch-screen snooze feature. The numerals are quite large and very easy to see on the grey illuminated face or with the nightlight changing colors. MoshiLifestyle.com, $49.95.